ronofrio Logistics, S.L. is a company specialized in the national and international transport of goods by road through refrigerated trucks. For this we have a fleet of 53 refrigerated trucks, which are constantly renewed, never exceeding the age of three years. 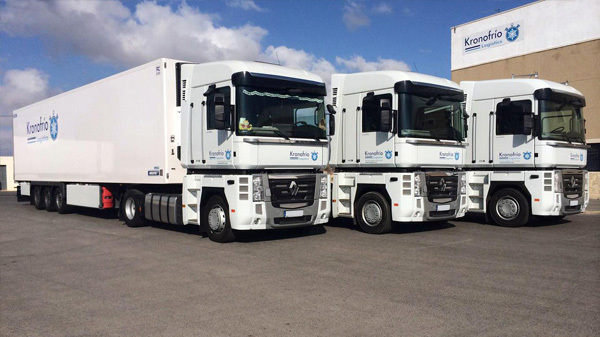 Our mission is to provide excellent service in national and international road transport, constantly adapting to the demanding demands of our customers and incorporating advances in technology that allow us to anticipate those needs. Our goal is to grow at the pace of the transport market and to incorporate logistics services. For this we incorporate professionals and train those we already have. We are a family business, combining professionalism and desire to excel with human values and passion for a business that started 20 years ago. We have space in 2500 meters ship in Elche for total or partial rental of the same. Our warehouse can be used both for pure storage of pallets or parcel goods and for storage and distribution of large items. We offer control and management of stocks, in addition our warehouse is located in a suitable location and location. For more information contact us at the following phone numbers or by email.